This iExpression can loop a segment of time of a property in various ways. By default, the region from the first keyframe to the last keyframe is looped, but you can also loop arbitrary other segments of time. In addition to normal cycle types, the expression also supports "seamless cycles" where the motion path is modified such that it loops seamlessly. Also pingping-loops (where every second loop plays backwards) and offset loops (where each loop starts exactly at the position where the last one ended) are supported. simple loop where the motion path is modified if necessary to create a seamless transition from the end of the loop to the beginning. continues with the beginning of each loop exactly at the position where the last loop ended such that the transition is seamless. If this option is enabled, the expression loops the region between the frames specified below. Otherwise it loops the region between the first and last keyframe. 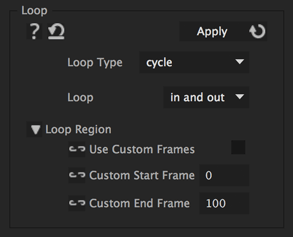 where the range starts that should be looped (only if the option Custom Start Frame is enabled. Otherwise the loop starts at the first and ends at the last keyframe). where the range ends that should be looped (only if the option Custom Start Frame is enabled. Otherwise the loop starts at the first and ends at the last keyframe).